The Burgerville chain encompasses 39 quick-serve restaurants in the Pacific Northwest. Six cities in South Central and Southwest Washington have at least one. The closest location to the Seattle area is the restaurant in Centralia. We try to always stop and eat a hamburger there when we pass through. 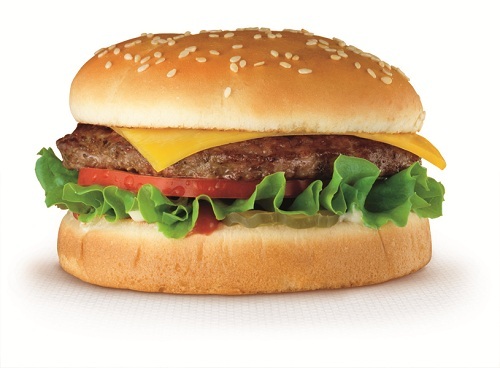 Because the hamburgers are made from vegetarian-fed and antibiotic-free beef, they seem to taste much better than most. Add a slice of Tillamook Cheddar and you have a delicious sandwich. Burgerville relies on local, seasonal ingredients whenever possible. Blackberries for their milkshakes, sweet onions from Walla Walla for onion rings and hazelnuts from Oregon for their Wild Smoked Salmon and Hazelnut Salad. Not only does this chain serve high-quality, tasty food, but they also use many sustainable business practices. They purchase 100 percent renewable wind power credits equal to the energy use in all 39 locations plus their corporate headquarters. By using wind power of this magnitude, Burgerville eliminates a huge amount of greenhouse gases. This is the equivalent of taking 1,700 cars off the road. Constantly improving and expanding their composting and recycling programs also makes Burgerville a “green” company. And this company loves their employees. They provide healthcare insurance, which is very rare at quick-serve restaurants. Burgerville contributes more than 90 percent of the insurance costs for employees and their dependents. If you’re in the neighborhood, I urge you to sample some of their menu items. They have hamburgers and lots more to choose from. This entry was posted in Restaurants, Towns, Uncategorized and tagged blackberries, Burgerville, hamburger, Hamburgers, hazelnuts, onions, Oregon, Tillamook Cheddar, Walla Walla on October 5, 2011 by admin.